Today, International Holocaust Remembrance Day, is also the 70th anniversary of the liberation of the most notorious of Nazi death camps, Auschwitz. Over a million people were murdered there, the vast majority of them Jews. Jack Mandelbaum's mother and brother died in the camp, but he was sent to a forced labor camp. 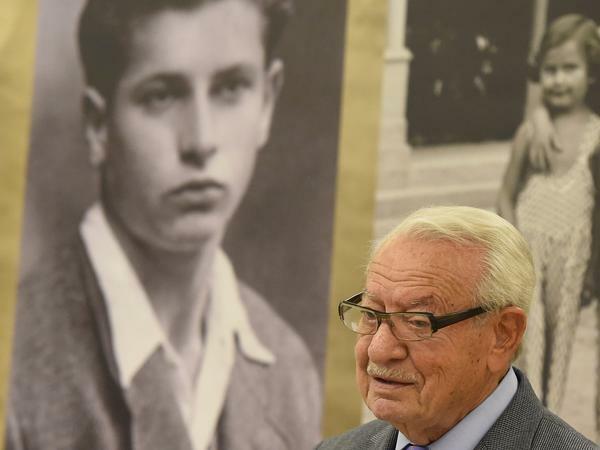 The Polish-born Holocaust survivor recently traveled to Berlin to help open an exhibit about the children of Auschwitz. He spoke with NPR's Soraya Sardhaddi Nelson. SORAYA SARHADDI NELSON, BYLINE: Jack Mandelbaum thrives on being an optimist. JACK MANDELBAUM: I'm a person of action. Anger doesn't get you any place. Hate doesn't get you any place. NELSON: The outlook is one he developed as a teenager surrounded by horror and despair. The nightmare began when he was 13 and living in the Polish port city of Gdynia. It was August 1939 in and the Nazis were about to invade Poland so his father sent the family to live with relatives in the countryside. He ended up in a concentration camp and Mandelbaum never saw him again. Then before dawn on a morning three years later, the SS came for what was left of Mandelbaum's family. MANDELBAUM: There was a lot of shooting and crying, and people didn't know what was happening because they had to rush out. Many people were even in their bed clothes. And we were lined up in the market square and then we were marched to a local brewery and as we came, there was an SS officer that was separating people to the left and to the right. NELSON: Mandelbaum says he clung to his mother and brother as the guards herded them to the left, but the SS officer learned that he had worked as an electrician's helper. MANDELBAUM: He grabbed me and pushed me to the other side. MANDELBAUM: The people who went to the left were sent to Auschwitz to be gassed. I never saw them again. NELSON: He was first taken to Gross-Rosen, a concentration camp where prisoners worked in a granite quarry. Food was scarce and their daily meal amounted to a single piece of bread and what Mandelbaum calls a grass-like soup. He remembers emaciated prisoners stuffing paper into their mouths to fatten up their cheeks so they wouldn't be removed for extermination. But Mandelbaum refused to give up hope. He says he poured what little energy he had into work, hoping he'd be released. MANDELBAUM: We had a good life before the war. My dream was to go back to this life, to be reunited with my family, and that sustained me. NELSON: So did not knowing that the Nazis planned to slaughter all Jews, which he didn't learn about until after liberation. MANDELBAUM: I was so weak at that time, I was down to about 80 pounds. NELSON: Mandelbaum was 17 when the Holocaust ended. The following year he emigrated to the United States and settled in Kansas City where he married, had four children and became a successful importer. It was nearly two decades before he began speaking publicly about the Holocaust, a decision he says he reached after talking to a neighbor. MANDELBAUM: He asked me what kind of sports did I play in the concentration camp, so all of a sudden it just opened everything up, how little people knew what was going on. And this is when I started to speak in different venues about my experiences. NELSON: A desire to share his story also brought him to Berlin last week. Mandelbaum says it's sad to see anti-Semitism on the rise here and elsewhere in Europe. MANDELBAUM: You know, when we were in the camps, we would always ask how can the world stand by and let this happen? So it's a matter of being vigilant in order to enlighten people how dangerous is if you become a bystander. NELSON: Soraya Sardhaddi Nelson, NPR News, Berlin. Transcript provided by NPR, Copyright NPR.